The opulent guestrooms at Hotel Captain Cook are the perfect place to unwind after a day exploring Anchorage. Enjoy total comfort and elegance with sumptuous linens and top-of-the-line toiletries from Gilchrist & Soames. 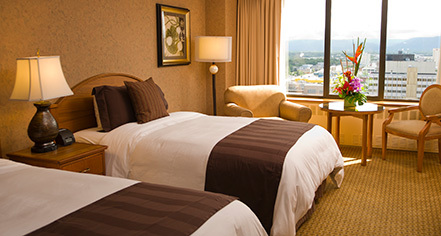 The hotel’s 546 luxury guestrooms, including 96 suites, assure guests a choice of deluxe downtown Anchorage lodgings and majestic views: the Cook Inlet, Chugach Mountains, Anchorage cityscape, or Mt. McKinley. As the only luxury hotel in Anchorage, Alaska, the staff’s meticulous attention to detail and famous hospitality provides an exceptional stay for business and leisure travelers. The stylish Deluxe Rooms features either one king or two double beds, custom-made furniture, a deep jewel-tone palette, and gorgeous views of either the Chugach Mountains or Cook Inlet. The spacious Junior Suites offer a separate sleeping and living area, including a sofa, work desk, two televisions, and gorgeous views. The roomy Executive Suite is an ideal choice for a small group or family traveling together. These one and two bedroom suites, found in Tower 2, offer separate bedrooms, a living area, and three baths. Amenities include breakfast credit, complimentary self-parking, and complimentary access to the Athletic Club. The Captain's Deck is the ultimate in convenience and privacy. Located on the 16th and 17th levels of Tower 2, these secured floors feature deluxe guestrooms and suites with spectacular panoramic views, and a shared private lounge. Guests can enjoy complimentary newspapers, full hot breakfast, evening hors d'oeuvres, evening beer and wine reception, and a well-stocked juice and soft drink bar in the lounge. Amenities include complimentary self-parking, and complimentary access to the Athletic Club. 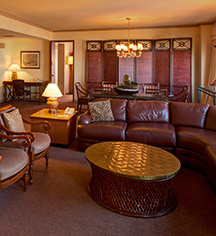 The luxuriously ample Crow’s Nest Suites, located on the 19th floor of Tower 3, feature one or two bedrooms and a large parlor. Amenities include access to the Captain's Deck Lounge, complimentary self-parking, and complimentary access to the Athletic Club.